The Vangater II lift is a single post lift which can be installed for side entry. It has a maximum of weight capacity of 600lbs. 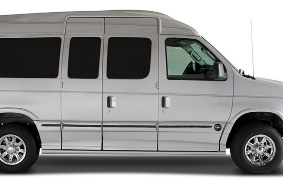 The Vangater takes up less room than most lifts and will not interfere with the reclining of the passenger seat. The Millennium Lift is a two post lift and is offered in several different lengths. Some lengths do require raised doors. 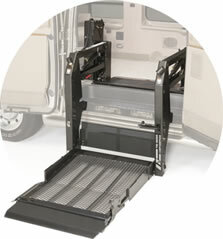 The Millennium is good for heavy loads up to 800 lbs and can be installed in the side or rear doors. 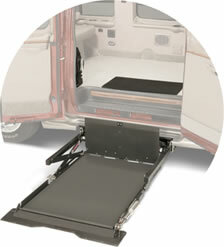 Under vehicle lifts are great for space saving on extended and regular length vans. 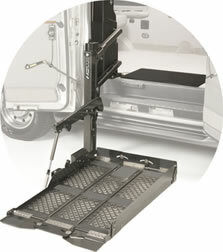 This lift has a capacity of 800 lbs and requires the 2500 or 3500 chassis. 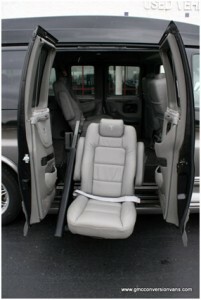 Companion seats can be installed in full size and mini-vans. This seat is great for individuals with difficulty stepping up into the van. Some customers require more headroom entering through the side or rear doors. Arbogast can have the doors raised into the roof to allow for 10 more inches of space. Not sure exactly what you want? No problem! Arbogast has experts ready to take your call, 1-866-975-3287.